YOU are invited to attend a free webinar provided by California Indian Legal Services. Learn about what the October 2014 Memorandum entitled “Policy Statement Regarding Marijuana Issues in Indian Country” issued by U.S. Department of Justice means. Get an overview of the Federal and California state marijuana laws. All from the comfort of your computer. We will explore the legal issues surrounding the cannabis industry. Learn about the laws that govern cannabis distribution, cultivation, possession, and consumption. Have your questions answered by Dorothy Alther, CILS’ Executive Director. 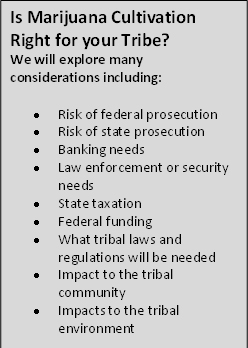 What is the difference between state & federal law and what does that mean for tribal lands? Make informed decisions concerning marijuana. Join us on Thursday, May 21st at 10AM to learn more about this timely topic and the possible implications for tribes.